Short answer: Yes. In a few more words: It’s not an iPhone killer as many out there labeled it to be but it can easily keep up with it. I wasn’t quite sure which one to get, the iPhone or the Palm Prē, till the last moment but I finally decided to take the risk and give the Prē the benefit of the doubt. The Prē can’t keep up with the iPhone in every single aspect, there just are a few things where Palm just had no chance of overcoming the two year head start the iPhone has, the biggest aspect for sure being the App store. But the Prē more than compensates for this shortcomings by throwing in a number of creative ideas and features even the iPhone with all its apps has nothing to come up against with, like Synergy or MULTI TASKING. Ever tried to listen to web radio on the iPhone while downloading a large PDF in your browser and looking up a number of addresses just received via email in the Google Maps app, switching back and forth between the latter two?! Well, go ahead. Try! The bottom line is, the Prē doesn’t have everything the iPhone has but it surely doesn’t fall in the category of all those phones desperately trying to imitate the iPhone as closely as possible, failing miserably on the way there. It comes with its own set of unique and stylish features that allow things that aren’t even possible on the iPhone and over time, I’m sure, it will catch up further. Besides, most of those things the Prē brings along right out of the box are quite polished and reliable making it a real pleasure to use. Touchstone charger: Works great and is well thought through (automatically takes the call when you take it of the charger while it’s ringing, automatically switches to speaker mode once you put it on the charger during a call, etc) BUT seems there are quite a few faulty touchstone chargers on the market (see below for details). Once you got a good one though, it’s just awesome. UPDATE: Form factor: With the slider closed it’s just tiny and cute, with the slider open it’s the most comfortable phone to hold while talking that I’ve ever seen. BUT the form factor also has its drawbacks. See below. Sharp edge at the bottom of the device: People have claimed it’s sharp enough to slice bread, but I really don’t see the problem here. Sure, it’s a sharp edge, but I don’t even feel in during my daily use of the device. I’ve never had the slightest complaint about this edge! Small, tiny keys on the keyboard and bottom of the screen to close to the keyboard: I’ve got small hands, small fingers, for me the keyboard is quite comfortable and not too hard to type on. I wouldn’t give up the hardware keyboard for the world! As for the bottom of the screen being to close to the keyboard: No problem here either. Though I must admit, I can picture people with larger hands having way more problems here. The keyboard for sure isn’t too large and while it isn’t a problem for me it definitely might be a point of complaint for some of you. Wobbly slider mechanism: Total crap! The slider is absolutely fine. It’s not 100% firm and stiff but nowhere near annoying or disturbing! Battery runtime: I somewhat agree with this one, but it isn’t worse than e.g. the iPhone. Just switch of push email and use WiFi when at home instead of 3G and battery runtime increases from intolerable to ok ;). A few more tips (in German) can be found here. Hard- and software adaption regarding Europe: Palm claimed that hardware and software adaption are the reason for the late release of the Prē. I know this is true as for the GSM support the Prē needs to work on European networks, but what about the rest of the hardware? What about special characters on the keyboard? There umlauts in German, accents in French and Spanish, etc. You could have adapted the keyboard!!! Even worse for the software: O2 stated things like “support for popular European social networks” (I don’t recall the exact phrasing) in its advertising for the Prē, but in fact the only thing supported is Facebook. I can only speak for Germany, but the most popular networks here are: StudiVZ, lokalisten and maybe Xing (for business). Besides, there other less important ones like Stay Friends and I’m sure Spain, Ireland und UK have their proper social networking sites besides Facebook. Not a single one of those is supported! In fact, Europe did not even get the same software version as the US. We are two versions behind! I honestly did expect more in this regard. Honestly Palm, if you want to win the hearts of your European customers, you’ll probably have to do more than just make your devices technically work on European networks. Please! Combined and instant messaging: The idea is admittedly awesome BUT what good is it if only AIM and Google Talk are supported? Again, I don’t know about the US, but in Europe, ICQ and MSN are far more popular. They should be supported since the initial US release of the Prē. I really can see no reason why those are not supported. Please Palm, this is a MUST. It is the feature I miss most!!!! Software keyboard: I really love my hardware keyboard but sometimes you just need to type a single word like a login or a street name on Google Maps, not worth the effort of sliding your phone open. This is not among the most important features to add, but a software keyboard would surely make nice plus! Auto-correct and auto-complete: The Prē has basic typo correction but nothing more. Even the oldest Windows Mobile phones have auto-complete (in conjunction with hard- as well as software keyboards). Leaving this out is a big one! On mobile devices, T9 or auto-complete just makes typing so much faster. That needs to be added as soon as possible! Support for third-party music players: Support for iTunes is really nice, but first of all I need the latest firmware version to able to use it (which isn’t available yet in Europe) and secondly, we probably all know that this cat and mouse game can’t go on forever. Sure, the Prē also support third party players like Windows Media Player or others via its flash drive mode, but it doesn’t provide a reasonable way to sync playlists. There’s not even a way to create playlists within the music app on the Prē itself. I’d be 100% OK not to use iTunes, but you can’t seriously expect me to sync hundreds of songs to my device and not have a single playlist, only being able to choose between all songs or a single artist or album to play. That’s not very satisfying. My suggestion: Focus on supporting other players for music sync instead of continuing that time consuming game with Apple. Lid for the USB charging cable: It’s so hard to reach and open that you’re probably annoyed by the second time you have to do it. Seems like a strategic design aiming to increase the sales of the overpriced, wireless touchstone charger. Sad, but then again, Palm’s goal is to earn money just like any other company out there, so somewhat understandable! Still, if the touchstone charger weren’t so overpriced it would be even more understandable. Touchstone charger: Palm obviously has or had a quality problem in the manufacturing of the wireless charger. I had to go to the O2 shop three times to exchange both, the back cover as well as the charger till I had a set that did actually work reliably. Before, my Prē would loose the connection to the charger from every few seconds to every few minutes, just to pick it up again shortly after that, bringing up the “battery charging” notification (along with the according sound) each time. This is just plain annoying and intolerable (see this video). A little bit of internet research also brought up that I’m obviously not the only one with this problem. Anyway, for those experiencing this issue, have your retailer exchange the charger (and possibly the back cover that comes with it). A perfectly working charger (like the one I own now) should not have this issue, not even once a day or so. My Prē hasn’t lost the connection to the charger in over seven days now, except for when I took it off the charger of course. Also, unlike some of the forums posts or Palm support guys tell you, the problem with this issue is not misalignment of the Prē on the charger. Sure, it has to be aligned right, in fact there are only two possible position in which the Prē will charge but you’re not required to align it to the millimeter. The magnets in the charger take care of the alignment as long as you’re not trying to put it on the charger in some completely awkward position like diagonal or so. UPDATE: Form factor: While perfect for your pocket and super comfy in your hand while talking, it has quite a few glitches. With the slider open, the phone seems extremely unbalanced when you type on the keyboard. Even more so if you’re trying to type one-handed. Especially for the latter case, I find this quite annoying. In the end, the Palm Prē is a great phone in my opinion. In a few ways it’s two years behind the iPhone, in most things it can totally take it up to the iPhone and in some ways, it even beats the cr** out of the iPhone. As long as Palm doesn’t think they can take it slow now (in which case they would be sadly mistaken) and as long as they keep the updates coming and address current shortcomings and problems with the Prē, it has the potential (together with future WebOS phones) to be mentioned in the same breath as the iPhone and any Blackberry. Oh, and as a last note: The reason I’m comparing it to the iPhone so much, although it’s not meant to be a so called “iPhone killer”, is because that’s the main competitor in functionality in my opinion. RIM / Blackberry I just don’t know well enough, and Android / Windows Mobile and manufacturers supporting those are just way too busy badly imitating the iPhone, trying to make their devices look like yet another iPhone without actually being one and more importantly without putting the necessary effort and creativity into the job to actually make their devices good and shiny. I just can’t get why they’re doing this, as Palm made the solution so obvious: Don’t copy everything, just copy the good and important features and copy them well! Then add a few of your own ideas. There must be some?! UPDATE: I see the need to revise my statement on Android above. I still think what I said is true for Android 1.x and according phones, but it seems this all just changed with the release of Android 2.0 and and a vast number of manufacturers jumping on the Android train. The new software version seems to do exactly what I recommended above. Copy all the good existing features like the iPhone’s app store idea, multi-touch / touch-oriented interface, the Pre’s combined messaging, synergy, hardware keyboard and multi-tasking. Then add some of your own ideas (like a killer navigation app that’s even free) or / and improve on the existing features like combined messaging, better hardware keyboard, etc. Combine this with a developer with nearly unlimited resources (such as, I don’t know, Google?!) and a variety of Hardware manufacturers willing to go along, and you get a system that should be gaining ground immensely fast, casting a huge shadow on the new Palm. More so since Palm is taking it really slow with its update policy and currently not doing much but fix bugs. (This article says a lot of the things I am thinking.) I really hope they have something big to show with the upcoming update(s) because otherwise I see a lot of dark clouds at Palm’s horizon, again! They still have a chance if they are willing to really open up their hardware market and push the OS. I have a Droid for work and it is a great phone, but I find I like my Pre Plus better, and so does my wife… With the 3d updates and now we know what kind of 3d support is there, it seems that even the fast processor in the Droid (snap dragon) can’t keep up with the Pre in 3d acceleration. 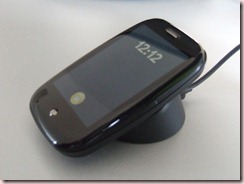 Palm needs to license its O/S to motorola or team up with Motorola and push WebOS mainstream. NO OTHER OS multitasks like it… not even Android 2.1 and for me and other business users, this is a HUGE HUGE advantage. Thus love this particular manual to greatly help discover the great fit of the new glasses frames. purchase it from the retailer than in the company shop.